On July 14, 2014, inspired by requests from other diabetics, Miss Idaho Sierra Sandison posted a photo on Instagram of herself striding confidently down the beauty pageant stage, an insulin pump secured to her bikini bottom. The photo went viral and has become a phenomenon that is challenging traditional standards of beauty. Diabetics across the U.S. are showing off photos of their own midriff bedecked with insulin pumps using the hashtag #showmeyourpump. The 20-year-old hopes she can be an inspiration to others, stating her diabetes diagnosis turned her life upside down. At first she tried to pretend she did not have diabetes, hoping it would go away. The media often tells young women that anything that deviates from the airbrushed standard of beauty Americans have become accustomed to seeing on magazine covers and TV screens is a flaw that needs to be hidden. It would be a challenge to hide a medical device the size of an old cassette player during a swimsuit competition. However, Sandison soon learned that ignoring the problem only lead to spikes and plummets of blood sugar, and the accompanying mood swings and physical illness. Gradually, she began to gain some control through a low-carb diet, ample exercise and insulin injections, but she was still frightened that others would judge her harshly for having a medical device on her body, and that it would be something she would have to live with for the rest of her life. Then, Sandison learned about Miss America 1999, Nicole Johnson. Johnson, who was diagnosed in 1993, wore an insulin pump during the competition and since her crowning has become an award-winning international consultant, fundraiser and advocate for diabetes research. Johnson earned a Doctoral degree in Public Health from the University of South Florida and Masters degrees in Journalism and Pubic Health, and then went on to advocate diabetes issues through televised journalism, magazine articles, and seven books. One of these books is a guide for young adults who are learning how to live with diabetes and another is her own autobiography. Johnson’s example inspired Sandison to acquire her own insulin pump and get control of her own diabetes before contenting in the Miss America 2104 beauty pageant. With the device, Sandison has been able to take better control her blood sugar and her life has improved as a result. A pump is able to administer doses more regularly than injections through a catheter placed under the skin that delivers basil insulin 24-hours-a-day to keep blood glucose within a normal range, an additional boost called a bolus when eating carbohydrates, and another bolus taken to correct or supplement high blood glucose levels. She was still nervous to attend the pageant with the device, but instead of criticism she received an outpouring of support and may be crowned the next hero of the diabetic community. She has inspired diabetic young women all across the country that wearing an insulin pump to the beach or pool parties will not make them any less attractive. People, especially children, who wear other medical devices, such as hearing aids and feeding tubes have also been inspired by Sandison’s bravery to defy societal conventions of beauty. Gradually, the visibility of devices such as insulin pumps serves as a connector to other people who share the same condition, a badge of courage and a symbol of survival. Sandison hopes others will learn from her example as she did Johnson’s, not only for their own self-empowerment and growth as individuals, but also to be of service and influence to other people. 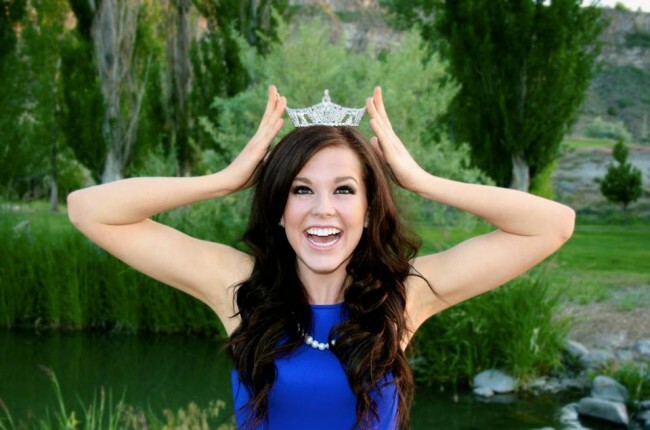 She has been amazed at how many diabetics she has inspired just by wearing an insulin pump at the beauty pageant and hopes to reach out to others during her year as Miss Idaho. One Response to "Insulin Pump Worn at Beauty Pageant Inspires Other Diabetics"